Things didn’t get off to a good start today, at roadworks in Portishead I hit a pot hole and got a rear puncture ruining the inner tube. I quickly replaced with a spare but within 1/2 mile Tom’s chain broke. The broken link removed and within 1/2 hour we were back on the road again but 5 mile later at Juggernaught City (more commonly known as Avonmouth) Keith’s clip-in rear light unclipped into the path of a 32 tonner. Needless to say it wasn’t worth risking life and limb to retrieve the pieces so we just carried on. It had been dry so far today, but now, just as we crossed the Severn Bridge into Wales, the skies opened and we had heavy rain for 4 hours all the way along the Wye Valley in the mist to Monmouth. These early days with Westcountry hills, pot holes and rain had taken their toll, so replacement brake blocks, inner tubes and rear lights were purchased from a Monmouth bike shop. 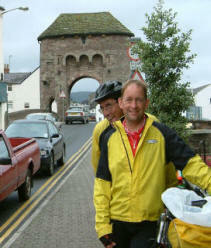 After Monmouth we followed some very quiet lanes roughly following the River Monnow to Grosmont. The day wasn’t quite over yet as Mark broke his chain just before our overnight stop at my sister’s house in Kilpeck, famous for its church, followed by a latenight powercut after returning from the local pub. Food – We ate in a fish and chip café in Chepstow to escape the rain, and another break in one of the many tea shops in Monmouth. There are plenty of places along the way for food breaks and, I’m sure, in nice weather, very nice scenery. The approximate route we followed for Day 4 is listed below (1:50 000). From Yatton follow B3133 towards North End. After railway bridge take R on lane towards Manor farm, At T by River Kenn take a L and first R.
Cross over M5 and take L at T on B3130, then R onto B3124 to Portishead. At roundabout with A369 take R to M5 J19. 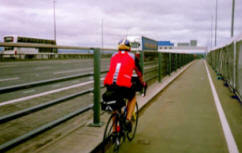 After M5 J19, take first L to Pill and follow NCR signs to cyclepath that runs over the Avonmouth motorway bridge. After bridge take L at T with road towards Avonmouth. Follow Lane to Tregate Bridge where L and R at T in St Maughans Green. Join B4521 at Skenfrith, and then turn R on B4347 to Grosmont. Turn R off B4347 at Kenchurch on to lane to Bagwyllydiart where L at T to Cross Llyde, Marlas and Kilpeck.